Whether they are actually conventional “sinkholes” remains to be seen. But allow me to advance a few more additional theories that have occurred to me after reading the rather ordinary ones that other so-called experts have come up with. While some have proposed that the holes were the result of extraterrestrial beings, it seems that no one has yet taken this concept seriously. That is unfortunate. ﻿Another few possibilities which I would like to entertain come from a slight acquaintance with an Anglo-Irish writer and satirist of my day, the Rev. Dr. Jonathan Swift, better known to 21st century readers as the author of Gulliver’s Travels. (Swift was born in 1667, and died in 1745, right in the midst of the 1700s, when I was very much in my prime). 1) The holes may have been created by giants, like Gulliver in Lilliput or the giants of Brobdingnag. Thus, they could have been the result of footprints in the permafrost. 2) The flying island of Laputa (see the accompanying illustration from Swift’s own book), which was very much circular in shape, could very well have landed at a certain point, and created those holes in some way. 3) The other odd thing that the inhabitants of Laputa were known for was their strange custom of throwing down rocks at rebellious cities on the ground, from their vantage point high in the sky. (Some of you in this future age of 2014 may find this comparable to the modern practice of aerial bombardment from airplanes. In truth, Swift’s description of this would have made the Laputan practice the very first example of this concept of warfare.) My take on this is that some very large rocks cast down by Laputan citizens could have been responsible for the Russian sinkholes. 4) The Laputan civilization was also very big on the blind pursuit of science without practical results. (In that regard, they are very much the opposite of myself, for all of my scientific inquiries and inventions were always driven by the possibility of practical applications.) For example, great resources and manpower are employed by the Laputans on researching completely preposterous schemes such as extracting sunbeams from cucumbers, softening marble for use in pillows, learning how to mix paint by smell, and uncovering political conspiracies by examining the excrement of suspicious persons. There is probably a good chance that one of their “preposterous” scientific investigations may have had something to do with creating large sinkholes in Russia merely to see if it were possible to create a tunnel that would extend to the other side of the world. 5) And finally, my favorite theory of all: airborne sharks. 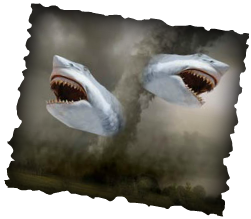 That's right, airborne sharks falling from the skies (again, a Laputan conspiracy? ), carried aloft as in the movie Sharknado, and falling en masse, creating a giant hole in the ground that looks for all the world like a sinkhole. If they can fly through New York City, why not Russia? So, those are my theories, my dear reader. You can take them at face value, express some skepticism or cynicism about their veracity, or perhaps even take them seriously. That will be up to you. As for me, I will continue to hold open any and all possibilities that have not yet seen the light of day. My “scientific method” depends on not closing off prematurely any avenues of research without first exhausting all ideas, notions, impressions, and viewpoints, no matter how preposterous or naïve.